If you get the error message: "Task '#######' reported error (0x8007000E): 'Out of memory or system resources. Close some windows or programs and try again.'" 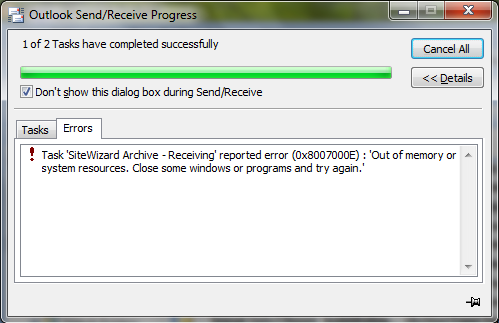 all you need to do to fix this is close Outlook and reopen it. This happens because Outlook has used too much memory. We have only seen this happen to Outlook 2007.